Typically, becoming a champion takes years of coaching, training, discipline and an unwavering belief in yourself. To become a Catch Champion, it simply takes an email and a bit of teamwork (although we recommend that you believe in yourself, too). A little background on the team here at Catch Des Moines. We are the convention, sports and services superstars and marketing masters that help bring visitors to Greater Des Moines, whether it’s through leisure travel or by helping to secure the events and conventions, big and small, that put Greater Des Moines on the map. We’re storytellers, we’re perception shifters, we’re logistical ninjas. What we need is you, the connectors. 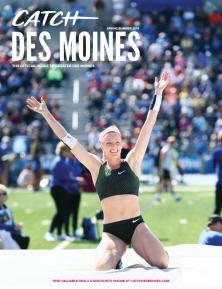 Are you a proud supporter of Greater Des Moines? Are you/your organization affiliated with any state, regional or national associations, organizations, boards or groups? Are there any events you/your organization attend that you think would be great for Greater Des Moines? This is your chance to go from fan on the sidelines to a crucial member of our winning team. On an individual level, simply reach out and let us know a group that you think would be a good fit. It can be an event that hosts thousands or a hobby group that delivers dozens, and everything in between. On an organizational level, we’d love to work with you to help spread this message to all employees. You provide the ideas, we’ll do the legwork. Tourism and events not only bring in dollars ($838 million in 2016 alone) that support your favorite restaurants, retailers and attractions (not to mention your friends and neighbors that work there), they contribute to your quality of life both through tax breaks and the creation of more of the amenities and events that make your community such a great place to live. The renaissance and transformation of Greater Des Moines has been built on collaboration and engagement. This is your chance to contribute to that home field advantage. Build up your community. Build up your resume. Build up the buzz. Becoming a champion has never been so easy and felt this rewarding. The ball is in your court. By checking yes I am giving permission for Catch Des Moines to send me emails regarding Catch Champions, and I understand that I can unsubscribe at any time. At Catch Des Moines our job is to help craft that narrative the drives visitors to Greater Des Moines. And we’re writing a new chapter every day.